Happy Monday cats and kittehs! Forget those signs that say “The end is near.” I’m here to announce they are WRONG! There will be a 2015. How can I be so sure?? 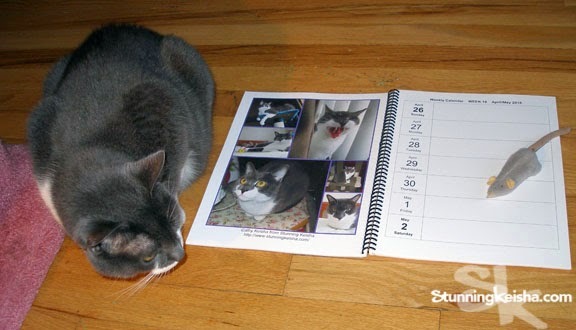 I got my 2015 Cat Blogosphere weekly planner that our very own Mom Paula of Sweet Purrfections slaved for months over. For the second year running, this stunning cat is prominently featured along with many of your favorite blogging and internet kitties. There’s lots of room to remind yourself of important things like what time to feed your cat. Look at those glossy photos! Shmousy toy not included. 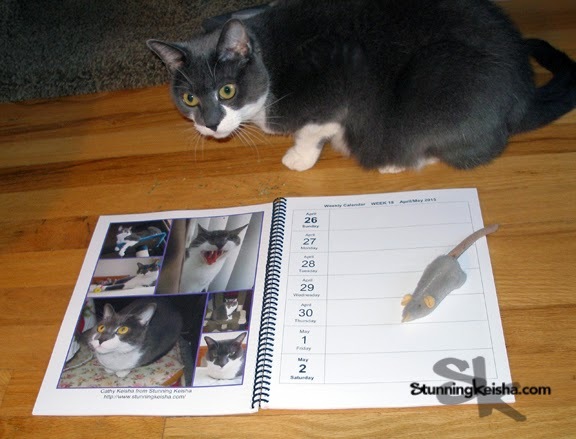 You can order your Cats of the Blogosphere weekly planner at Lulu.com. Enter the code SAVE35 (all caps) to get 35% off. I know my readers want to collect everything with this stunning face on it and who can blame them? This beautiful 117-page spiral-bound book is sure to be a collectors item. Act quickly as they are a limited edition and won’t be available after the first printing is sold out. I got mine (when the discount was a lot less); make sure you get yours or you might start believing that the end is near. It’s not gonna be discounted further. Phew! We are so relieved there will be a 2015! Darling, did you notice we are only a few weeks apart?? Plus, glad you confirmed we'll make it to January. Whew. That's good news, CK! Love your stunning photos in the planner, it looks like Mom Paula did a great job with it! Yep, total proof that 2015 will not only happen, but that it will be GREAT! That weekly planner looks amazing. And you look like a real model, of course. I am very relieved that there will be a 2015. I may make mum stay on the week of your photos, or I might make her take my page out and put it next to yours so I am closer to you than Spitty is. Wow, it looks terrific. We can well imagine it took Paula ages and ages to complete it. The stunning is everywhere CK! We're so glad to hear that 2015 is going to happen after all. That looks fantastic! I like the big size. As you said, there is lot of room to record important things. Like snack time, play time, etc :-) Hopefully not too many vet appointments! I think mine might have come while I was out of town and I haven't even opened it yet! We're so glad you like the calendar. We know how much Mom Paula worked on it because she lived in front of the computer for about 5 months completing the calendar. She is already making plans for 2016, so stay tuned! .... and for our calendar to arrive. Love your pictures in the CB calendar. We just love the calendar again this year. M & D figured out they can share this one because the spaces for writing are so large. Enjoy. I did not wait for any discount I don't think. We got our fast! Did you see that you are I are right next page to each other?? Is your page the most STUNNING? I'll bet it is! It is worth getting just for you, CK. I can then gaze on you to my heart's content! 2015? But I'm not finished with 2014 yet. Thanks for reassuring us that the END is not near. We got ours. No end for us! Well, I sure hope there will be a 2015!!! Aaaaw CK yous so cute. Weez in da calendar too. Weez bet it looks just purrfuect. Dat's a gweat discount. An entire week of you....who could resist? I'm glad to hear 2015 will be around.....my birthday is January 1st and I'd hate to miss it!